There is a significant portion of the premiere of Fear the Walking Dead where the characters are so firmly rooted in the drama of a blended family dealing with drug addiction and the various goings-on of an East Los Angeles high school that, even though the first three minutes feature one of the titular creatures gnawing on someone's face, you could easily forget this is a series about the zombie apocalypse. And even after the super-sized 90-minute premiere, it's difficult to tell whether or not that's a good thing. There are certainly plusses and minuses to the show's slow-burn introduction of the end of the world – most of them have to do with the way the inevitable end is remanded to the periphery. In fact, aside from a silhouette that may be one the undead or may just be an unkempt individual wandering in a public park and some conveniently well-photographed video footage, the only direct encounters any of the characters have with a zombie come at the beginning and the end of the episode. It is a deliberate choice made by writer Dave Erickson and director Adam Davidson that initially feels risky and kind of exciting, but only because the audience is already so well acquainted with this particular world. The pilot is flouting the very thing whose popularity allowed it to spring into existence in the first place. 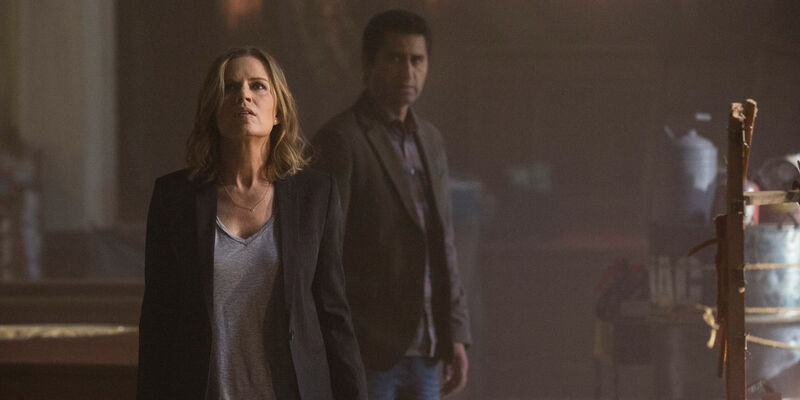 By not putting zombies front and center, Fear leaves a gaping hole that must be filled by something – and the creators (along with Robert Kirkman) are doubling down on the idea that by casting great actors, like Kim Dickens and Cliff Curtis, and giving them reasonably well-rounded roles, it will make watching the end of the world all the more compelling. The focus on character also grants Fear the Walking Dead an opportunity to do what its predecessor, The Walking Dead, never had an opportunity to do: Build the story of its characters at the same time the world around them falls to pieces. As you undoubtedly recall, the original series began with Rick Grimes emerging from a coma, and then finding himself thrust into a harsh and unforgiving environment where everything had seemingly changed overnight – at least to him, anyway. That left a lot of unanswered questions and, more importantly, essentially made Rick and the rest of the characters into thin characters whose only motivation was to not die. Now that's not exactly the worst motivation for a character to have – obviously, when you consider the phenomenal success the series has had over the course of its five seasons, it's worked out pretty well – but it doesn't give the audience much to connect with and to care about, especially when the characters in question are routinely asked to become fodder for the roving carcasses on which the entire premise was built. Here, Erickson and Davidson recognize this as a chance to undo some of the issues that have plagued The Walking Dead at times, and for this new series to begin by presenting the audience with people they can care about – or at least empathize with, since everyone watching knows what's coming. And Fear uses that knowledge to its advantage. More than once during the first episode, there is a build-up of tension that wouldn't necessarily work if viewers hadn't been tuning in to a similar zombie show since 2010. For instance, watching the camera slowly creep up on the principal at the high school Kim Dickens' character works at, all while the music builds to an eerie crescendo, would have felt like parody had viewers not been trained to read that moment as inherently ominous. But, as it did by shifting the focus away from the zombies and onto the dysfunctional family dynamics at the series' core, Fear subverts the audience's expectations when it comes to building apprehension in a way that's worthy of praise, even if it doesn't always quite work. For one thing, the already slow-moving pilot ostensibly stalls out midway through, as the story works to give some context to Travis (Curtis) and Madison's (Dickens) situation, outlining who Alicia (Alycia Debnam-Carey) and Nick (Frank Dillane) are. Taking time to establish Alicia as an over-achiever with a bright future ahead of her, and Nick as a heroin addict whose unsure whether or not he's losing his mind is fine and arguably necessary, especially since Dillane is asked to do some serious heavy lifting in terms of providing the drama with pathos. Still, the info dump takes a lot of wind out of the pilot's sails, a problem that is not helped by the shoehorning of an unnecessary sequence to introduce Travis' biological son Chris (Lorenzo James Henrie) and ex-wife Liza (played by the fantastic Elizabeth Rodriguez). With all that these initial 90-minutes have going on, Chris and Liza could have easily been introduced in the second episode, thereby relieving the pilot of some of its expositional burden and hastening the pace in a way the episode needed. Besides, considering Chris has been written as the sort of teenaged character whose only purpose is to make his parents' lives superficially more difficult, the episode would have been better off sticking with the little-seen zombies as the primary source of pending dread. Right now, though, that sense of portent (of zombies, not Chris' moodiness) is strong and the series knows how to wield it. There is a palpable sense of anxiety when Travis and Madison are stuck in traffic near a congested onramp, and that's well before the gunfire starts. Moments like these give credibility to the series' wonky title, and help combat the sense that certain parts are actually aiming to accomplish the opposite by saddling characters with terrible lines like "they couldn't just get up and walk away," while having them stare at an enormous pool of blood. Much of what works about the pilot comes from the way its urban setting gives the series a completely different palate to work with, and how the narrative goes about plausibly depicting the gradual collapse of a major U.S. city. That sincerity makes things like Travis' dubious motivation for checking out a heroin den in the middle of the night or Madison's constant refusal to believe people are turning into flesh-eating monsters seem a little less problematic. In the grand scheme of things, Fear the Walking Dead still has some kinks to work out, but maybe that's a good thing, as it means this prequel has something to build toward besides the end of the world as we know it.